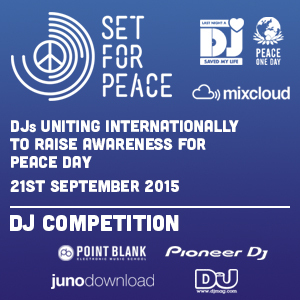 Set for Peace 2015 DJ Competition – The global community for audio culture. Peace One Day and Last Night A DJ Saved My Life Foundation have joined forces; calling for DJs from all over the world to unite and raise awareness of Peace Day, 21 September, by creating a ‘Set for Peace’. We would love to have you on board too! Dedicate your mixes to peace by participating to the Set for Peace global Mixcloud competition!